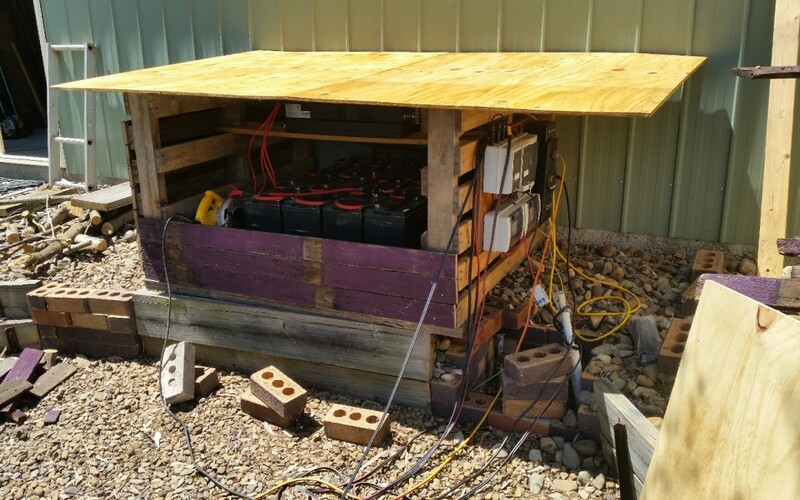 We have a second solar panel/battery system we purchased to give us additional power, and it required a new home once we arrived to protect the Switchboard, Inverter, Controller and Batteries. So we built a box to house it all. As one of our focuses is recycling, reuse and re-purposing the new Solar Box was built out of many reused items. Wooden Pallets, Old fence palings, Recycled timber sleepers and a few new bits of plywood. The box needs to protect the solar elements and essentially be weatherproof, but with good ventilation. As we had had to house the system on Brisbane before we moved, we had a good idea of what was required. 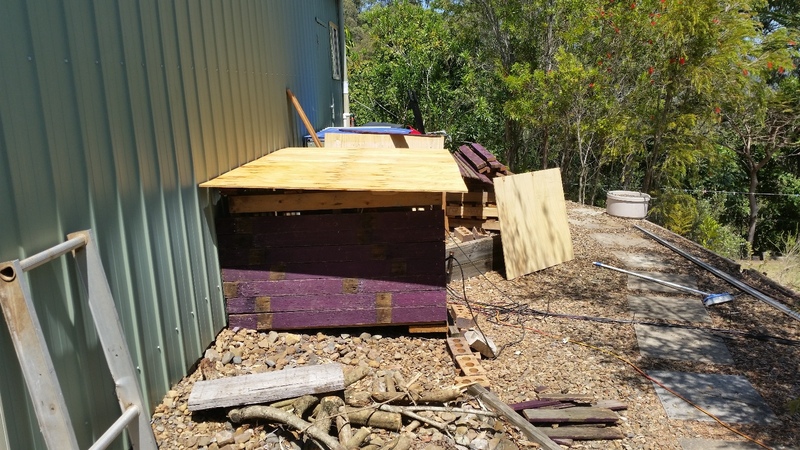 The idea originally came to me from a dog kennel I had built many years ago in Sydney,which was essentially 4 wooden pallets tacked together with a plywood roof. So we used fundamentally the same design. The new Solar Box sits behind the shed, next to the existing system battery box. Once we had levelled the area, the front of the base pallet was placed and supported with timber sleeper cut-offs. 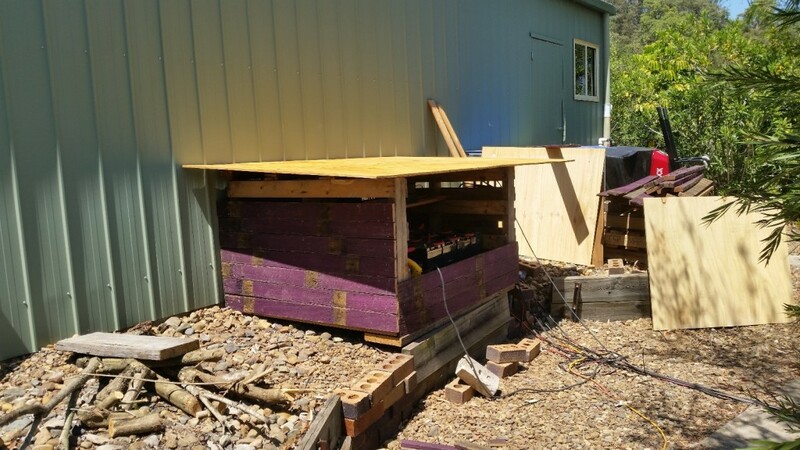 Two more wooden pallets were used to create the side walls. The roof supports are reused fence palings that support the roof and hold the side walls in place. The palings were picked up for free from our local street in Brisbane, and are original hardwood palings – probably dating back to the 60’s. They also happened to be purple, which quickly became the colour scheme for the box. The palings were also used to “clad” the open side of the box, and the front side of the battery compartment. The roof is marine ply, which has since been sealed, estapoled and painted. (Purple of course:)) The roof has a large overhang on the switchboard side – for weather protection. It is, in no way, ideal to have the switchboard outside, but re-jigging everything and installing it in the shed is not an option yet as we have major electrical works to do in the near future. So it sits on the side of the battery box and is accessed from the side of the box. Solar panel cables run from the roof of the house, through the garden and back to the switchboard and box. Power cables run back from the Inverter(inside the battery box) to the house and the deck. The system structure is not perfect, but works well for us and supplies us with power, and keeps the solar system elements dry and protected. We will tidy it all up when the house gets wired on the new system. Till then our big purple box works well.